'FIRST WEDNESDAY' OPENING: 5/2, 7 - 9 P.M. ARTICULATE ARTIST TALK: SUNDAY, 5/6 AT 4 P.M. Driven by metaphorical narratives, Kelli Scott Kelley's exhibition, "Shadow," takes inspiration from Carl Jung, who once said, "Everyone carries a shadow and the less it is embodied in the individual's conscious life, the blacker and denser it is. It may be (in part) one's link to more primitive animal instincts, which are superseded during early childhood by the conscious mind." Here, Kelley explores dualities that exist within ourselves and the "dichotomies that we confront through attempts to connect with other sentient beings and with the natural world." 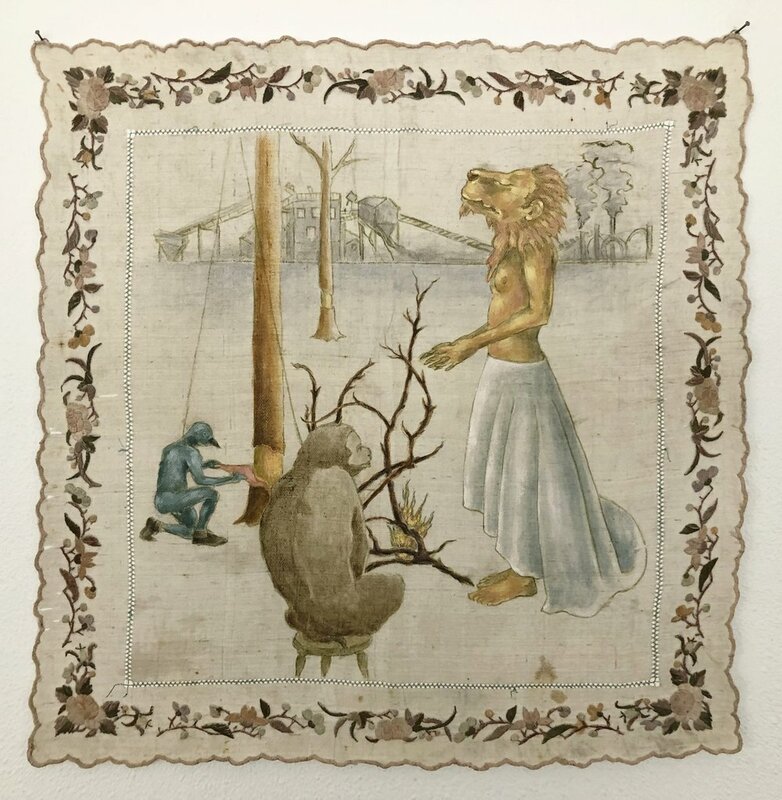 The characters seen in her acrylic on repurposed linen works find themselves interacting in ambiguous domestic and landscape settings confronting alienation and intimacy with an underlying sense of longing, loss, and a yearning for connection and unity. Since moving back to her hometown of Baton Rouge, Kelley has been teaching art at Louisiana State University, where she is now an Associate Professor of Painting. Kelley has shown her work across the country including Hooks Epstein Gallery, Mississippi University for Women and the Boulder Museum of Contemporary Art. She received her MFA from The University of Massachusetts at Amherst and has been an artist member of BRG since 2003. This exhibition is presented alongside the latest works from Leslie Friedman, David Scott Smith, and Michaelene Walsh. All works from these four artists are on view, free of charge, during normal gallery hours (12 - 6 p.m., Tue - Sun) through May 31, 2018.